LASER COMPONENTS USA, Inc. (LCUSA) established a presence in the US in the year 2000 through the acquisition of the former Laser Analytics, Inc., producer of lead salt lasers and Tunable Diode Laser (TDL) spectroscopic instrumentation which had been in operation since 1974. With production transfer of the TDL to LASER COMPONENTS in Germany, LCUSA positioned itself as a base of operations for the sales, marketing and distribution of photonic products for North America with products from our manufacturing sites in Germany, Canada and the US, as well as from well-selected international suppliers. Customer service, supplier growth, and employee development continue to remain among our highest priorities. Serving the photonics industry, our employees strive to develop creative solutions for today's increasingly complex manufacturing demands. 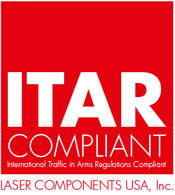 LASER COMPONENTS USA is ITAR registered and compliant according to the United States of America, Department of State. Laser Components USA and Laser Components GmbH in Germany have a Manufacturing License Agreement (MLA) that is approved by the United States of America, Department of State, Directorate of Defense Trade Controls (DDTC) for the controlled export of ITAR optics specifications for the purpose of manufacturing ITAR laser optics in Germany that may be used specifically in USA military components.